We recently did a live recording session with the Jack Cheshire band (more about that to follow) and as in these situations you can never have too many cameras, we rigged up an iPhone 6S for some roving video – with a high quality stereo audio track to match. To make sure we had the best possible audio track (in this case it’ll form a guide track though in other situations it would be a broadcast quality stereo track) we made a nifty rig with the iPhone and Beastgrip Pro hooked up to a DPA d:vice™ VIMMA-A audio interface and two d:screet™ 4061 Omni mics in stereo. Secure the d:vice™ Audio Interface to the outside front of the Beastgrip Pro. There’s a flat surface out of the way in the center of the front panel. A couple of lateral electrical tape winds will do the job. Attach the DPA d:screet 4060 or 4061 mics to the d:vice, wind the excess cable and tape it in place on the sides of the Beastgrip. If you have a lense attachment as we did, that works nicely to wind the excess cable around without getting in the way. Make sure the DPA mics extend up about an inch, out of the way of any parts you might hold or touch during the filming. Use electrical tape to secure them in place. Attach the iPhone, lightning cable connector, open the d:vice™ App, and you’re away! There’s nothing that will give quite the same quality of stereo recording directly into the iPhone 6S as the DPA d:vice™. For a video recording App we used Mavis, with the two mics set up via the DPA d:vice App and locked off with gains set in Stereo mode. There’s a short video at the end of this post in which you can hear the recording directly from this rig, as it moves around the room between the guitarist and drummer. Remember this is recording the room levels, not the desk audio. It gives a very clear representation as it moves around the room, with excellent dynamic range and low noise. 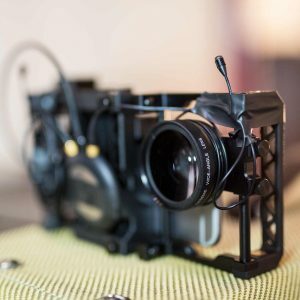 Once you’ve spent a couple of minutes taping the rig in place, this forms a perfect pick-up-and-go solution for recording amazing quality stereo audio and video content. For more information or to try out the DPA d:vice™ kit with your rig, please get in touch.